What is so special with lakes which make them worthy of a holiday adventure? When one sets eyes on the Lashihai Lake Wetlands, this question would not arise. The Lashihai Lake Wetlands is such a magnificent place that tourists often find themselves wanting to stay much longer because of the serenity that they feel when they are here. The Lashihai Lake Wetlands is also labeled as the National Wetland Park. It only takes about 30 minutes of driving to be able to get to this place. The elevation is up to 2,500 meters. 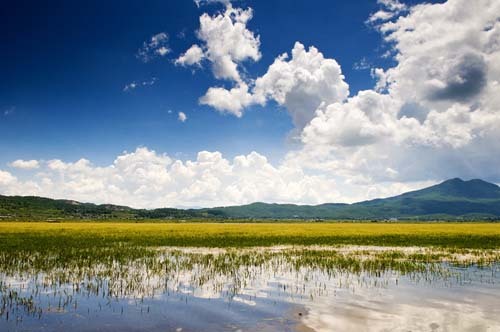 Because of that, this gives a wonderful view of the province and the climate is also much cooler than other parts of Yunnan , even during the summer months. Rich in cultural and biological diversity, the Lashihai Lake watershed is home to two minority ethnic groups, the Naxi (nà xī zú 纳西族) and the Yi (yí zú 彝族), and provides critical habitat for the endangered black-necked crane. 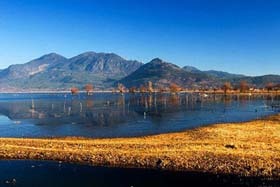 The watershed is also the primary water supply to a large downstream population and the rapidly growing tourism industry in the historic city of Lijiang. Around Lashihai Lake lives the Naxi People, who shows such enthusiasm towards life, and nature. They love festivals and find joys through simple things in their simple primitive life. They worship nature, and have different festivals and ceremonies for gods of Nature, God of Wind, God of water. And the Black Yi people, who are still keeping the best traditions of their own, grow seas of potato on the mountain side. While from a poorer class, Yi women are the only women who walk with straight back, full of dignity and elegance. Since the Lashihai Lake Wetlands is frequented by a lot of tourists all year round, there are numerous activities which can be enjoyed here. Some locals offer boat rides or fishing trips, which is such an enjoyable experience getting closed to the lake and the villages around there. The offers come with guides. There are also several other things which can be done within the area. Yes, these two are one of the most popular activities which can be done while staying in Lashihai Lake Wetlands. The lake has calm and crystal-clear waters, so boat rides are relaxing. Tourists can avail the boats which are for rent. These small businesses are operated by locals too. For the first timers, asking for the assistance from local tour guides would be a brilliant idea. They know which part of the lake is most peaceful, making it perfect for those who simply want a tranquil experience. If visitors opt to go fishing, the local tour guides can also take them to the part where it is easiest to catch some fish. The waters of the Lashihai Lake Wetlands are abundant with different types of fishes. Oftentimes, even the locals are seen fishing here for food and also for their source of income. 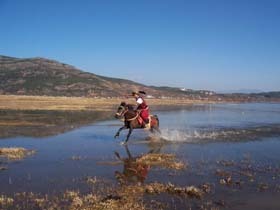 Since the vicinity around the Lashihai Lake Wetlands is also used as farmland, tourists might also enjoy the horse riding adventure. The horses are for rent for a few hours and visitors can ride them as they stroll around the scenic locations. The most popular route is the Horse Tea Trail. This is the classic path which tourists could take. The surroundings are beautifully decorated with lush trees and a whole lot of greeneries. When people take this path, they would also be able to pass by lakes and waterfalls. During the trail, there are also local merchants who sell different souvenirs and other local products. For tourists, it is best to ask a guide to come along. That way, if they would like to purchase some of the products along the way, the guide would be able to communicate with them in Chinese. They could also help out in haggling for prices. For the bird enthusiasts, spending a few days in Lashihai Lake is a great idea, especially during the months of December to February. This is the home of more than 57 types of birds. Hence, they are seen flying around the area anytime of the year. 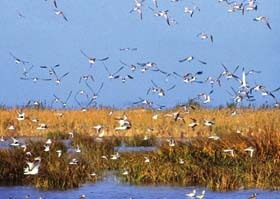 During the migratory season, the population of the birds increases. More than 30,000 birds go to this place when the winter months hit the European and Australian continent. Location: Located about 10 kilometers away from Lijiang center. 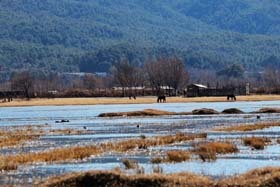 How to get there: There is no public transportation from the main streets of Lijiang to the Lashihai Lake Wetlands. Cabs can take tourists here and the ride takes about 20 to 30 minutes. 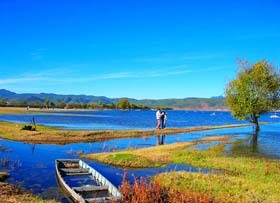 Tips: The autumn months is the best time of the year to visit the Lashihai Lake Wetlands.